After strong returns and low volatility in 2017, the investment environment has proven far more challenging this year. Investors face a seemingly endless list of global risks: escalating trade wars around the globe; high levels of debt across government, corporate and household sectors; political uncertainty; and potential contagion from recent events in Turkey and Argentina. The withdrawal of liquidity has been a key driver of financial markets this year. Central banks have been shrinking their assets, with rate hikes in the US and UK exacerbating the liquidity drain. Bond markets are already reflecting a more uncertain outlook as yield curves flatten and credit spreads widen. We have also seen volatility in currencies and commodity prices while cracks are showing in some high-profile US technology stocks. The market correction in the first quarter of this year is an important reminder of how quickly volatility can return. South African investors also have to contend with an economy in recession, ongoing policy uncertainty and an emerging market environment that is no longer supportive. The top 40 shares in SA are down 15% in US dollars since the peak in January, compared to a -3% decline in rands (as at 31 August 2018). Given the contribution of foreign earnings to shares on our exchange, the dollar return paints a more realistic picture of the environment and deteriorating investor risk appetite. Against these uncertain and volatile market conditions, the Investec Opportunity and Cautious Managed Funds have performed well, and in line with their long-term return profiles (Figures 1 and 2). The Funds not only kept pace with the peer group in a strong market in 2017, but more importantly, have proven far more resilient in the challenging market conditions we have witnessed so far in 2018. Both funds have produced top decile performance over the one year ending August 2018. Past performance should not be taken as a guide to the future, losses may be made. Source: Morningstar and Bloomberg, calendar 2017 and dates to 31.08.18, performance figures are based on lump sum investments, NAV based, inclusive of all management fees but excluding any initial charges, gross income reinvested. CPI inflation lags by one month. A Inc ZAR class unit inception date of the Investec Opportunity Fund and Investec Cautious Managed Fund: 02.04.00 and 02.04.06 respectively. TER of the Investec Opportunity and Investec Cautious Managed Funds (A class): 1.64% and 1.77%, respectively. Highest and Lowest refers to the highest and lowest 12-month rolling returns since inception (A class). Highest: 43.8% and Lowest: -15.7% – Investec Opportunity Fund; Highest: 23.8% and Lowest: -6.8% – Investec Cautious Managed Fund. The ability of the Funds to perform well in different market conditions is driven by our absolute return philosophy. Combining growth exposure with real-yielding income assets, commodities and cash, allows us to construct multi-asset strategies that maintain a balance of exposures with sufficient growth levers and shock absorbers to perform through the full market cycle. Over the long term this approach has provided our investors with strong real returns with lower absolute volatility of returns, lower drawdowns in equity bear markets and meaningful participation in bull markets (Figure 3). Past performance should not be taken as a guide to the future, losses may be made. Source: Morningstar, dates to 31.08.18, performance figures are based on lump sum investments, NAV based, inclusive of all management fees but excluding any initial charges, gross income reinvested. Given market crossfires and widespread uncertainties, how are we positioned? We believe investors shouldn’t take a side in the market crossfires. The investment environment calls for identifying best-in-class businesses rather than proactively positioning portfolios for one specific market outcome. Now, more than ever, it is important to ensure that any investment in a business is based on strong fundamentals, and not an attempt to lock in potential benefits of specific macro regimes that appear to be firing across markets. In a tightening liquidity cycle, investors should not expect returns to come from multiples rerating. Returns will be driven by sustainable growth. Global quality companies continue to be our preferred asset class on a bottom-up basis. Both the Investec Opportunity and Cautious Managed Funds have largely maintained a maximum offshore exposure. We have carefully combined more established and defensive quality stocks with newer quality opportunities offering faster growth. Some examples of what we consider to be traditional quality companies are in the consumer staples and healthcare sectors, e.g. Unilever, Beiersdorf, Nestlé, Johnson & Johnson and Becton Dickinson. These businesses provide defensive attributes and have generated returns that are less correlated with the market. They also offer sustainable and dependable growth as they continue to invest heavily in their brands and in innovation, position themselves in attractive categories, markets and channels, and as global players benefit from key trends such as ageing populations, wellness and urbanisation. Lastly, we believe our holdings are resilient in the face of consumer disruptive forces, offering protection in the portfolios in the event of a down cycle. We have also invested in a new ‘wave’ of quality companies, still with the quality characteristics we seek, but with faster growth potential. One example is ASML, which has a near monopoly position in the manufacture of lithography equipment, a critical component of computer chip design and production. Its global, dominant position and technological leadership give the business significant barriers to entry in an industry with huge growth prospects, particularly when considering trends in digitalisation, and new technologies in areas such as robotics and artificial intelligence. Importantly, what these businesses all have in common is the opportunity for structural growth, with a lower sensitivity to the economic and market cycle. This has led to greater resilience in more challenging times. Figure 4 illustrates the performance profile of the offshore component of our local funds. Past performance should not be taken as a guide to the future, losses may be made. Source Morningstar, calendar 2017 and dates to 31.08.18, NAV based, inclusive of all annual management fees but excluding any initial charges, gross income reinvested, in US dollars. Highest and Lowest refers to the highest and lowest 12-month rolling returns since inception. Highest: 54.4%, Lowest: -38.7% – Investec Global Franchise A Acc share class (**launch simulation date: 10.04.07). The strong performance from our global equities year to date has contributed significantly to absolute returns on a 12-month basis. Most notable has been the strong dollar performances among our financial and technology stocks, outside of the FAANG stocks (which we do not own), bolstered further by the weakening rand. (FAANG refers to Facebook, Apple, Amazon, Netflix and Alphabet’s Google.) Currently, FAANG stocks do not offer better growth, quality and/or yield versus the stocks we own. We believe that global quality companies (and locally listed offshore businesses) remain well placed to deliver attractive long-term risk-adjusted returns from here. In these late stages of the bull market, portfolio resilience is more important than ever. 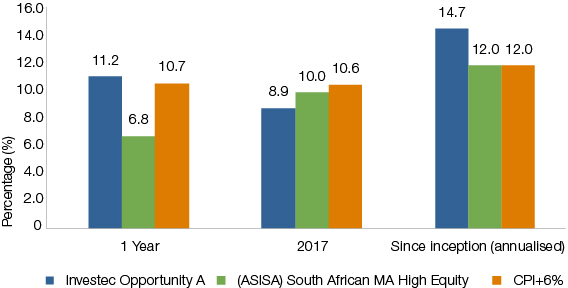 Aside from global equities (and locally listed offshore businesses), we believe SA bonds offer attractive absolute return opportunities for SA investors. Over the past year, we have substantially increased our holdings in SA nominal bonds. Given the weak local growth environment, we believe domestic banks, retailers and property stocks will struggle to deliver circa 7-8% over the medium term. Local cash is currently generating a similar return. Local bonds, however, are yielding a guaranteed coupon of 9.5% if held to maturity over the next ten years, outperforming cash and with a third of the volatility of equities. 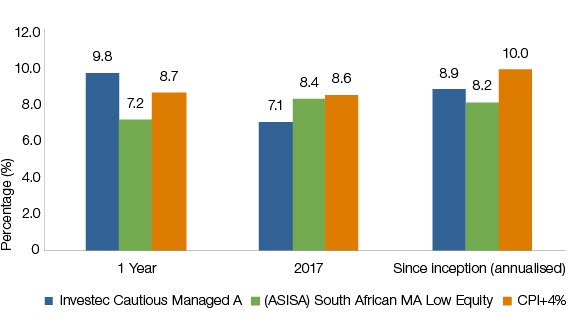 This means that SA bonds are potentially offering real yields of 4%-5%, providing a healthier real return opportunity relative to the local equity, property and cash markets. Additionally, local bonds are negatively correlated with offshore assets, meaning they can act as a natural hedge in the portfolios against any potential rand strength or equity weakness. The combination of global quality equities and local nominal bonds should help to preserve capital and generate inflation-beating returns. As the outlook becomes increasingly uncertain, and liquidity is drained from global markets, we believe the Investec Opportunity and Cautious Managed Funds remain well placed to deliver attractive risk-adjusted returns for the long term. All information provided is product related, and is not intended to address the circumstances of any particular individual or entity. We are not acting and do not purport to act in any way as an advisor or in a fiduciary capacity. No one should act upon such information without appropriate professional advice after a thorough examination of a particular situation. This is not a recommendation to buy, sell or hold any particular security. Collective investment scheme funds are generally medium to long term investments and the manager, Investec Fund Managers SA (RF) (Pty) Ltd, gives no guarantee with respect to the capital or the return of the fund. Past performance is not necessarily a guide to future performance. The value of participatory interests (units) may go down as well as up. Funds are traded at ruling prices and can engage in borrowing and scrip lending. The fund may borrow up to 10% of its market value to bridge insufficient liquidity. A schedule of charges, fees and advisor fees is available on request from the manager which is registered under the Collective Investment Schemes Control Act. Additional advisor fees may be paid and if so, are subject to the relevant FAIS disclosure requirements. Performance shown is that of the fund and individual investor performance may differ as a result of initial fees, actual investment date, date of any subsequent reinvestment and any dividend withholding tax. There are different fee classes of units on the fund and the information presented is for the most expensive class. Fluctuations or movements in exchange rates may cause the value of underlying international investments to go up or down. Where the fund invests in the units of foreign collective investment schemes, these may levy additional charges which are included in the relevant Total Expense Ratio (TER). A higher TER does not necessarily imply a poor return, nor does a low TER imply a good return. The ratio does not include transaction costs. The current TER cannot be regarded as an indication of the future TERs. Additional information on the funds may be obtained, free of charge, at www.investecassetmanagement.com. The Manager, PO Box 1655, Cape Town, 8000, Tel: 0860 500 100. The scheme trustee is FirstRand Bank Limited, PO Box 7713, Johannesburg, 2000, Tel: (011) 282 1808. Investec Asset Management (Pty) Ltd (“Investec”) is an authorised financial services provider and a member of the Association for Savings and Investment SA (ASISA). A feeder fund is a fund that, apart from assets in liquid form, consists solely of units in a single fund of a collective investment scheme which levies its own charges which could then result in a higher fee structure for the feeder fund. The fund is a sub-fund in the Investec Global Strategy Fund, 49 Avenue J.F. Kennedy, L-1855 Luxembourg, Grand Duchy of Luxembourg, and is approved under the Collective Investment Schemes Control Act. This document is the copyright of Investec and its contents may not be re-used without Investec’s prior permission. Issued by Investec Asset Management, November 2018.